RVWS was pleased to work with Greg DeJong this summer to produce multiple pieces of printed and online promotional campaign material. RVWS worked with Greg to develop a new campaign logo and applied it to each of his pieces of promotional material. 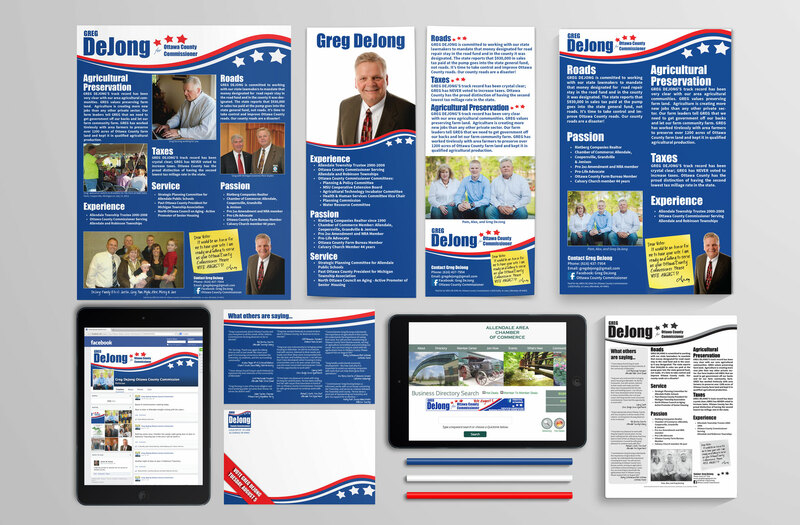 This project included developing yard signs, folded postcard mailers, palm cards, newspaper advertisements, community flier advertisements, online banner advertising, Facebook banner artwork, and special postcards. You can follow along with Greg’s campaign on Facebook and remember to VOTE GREG DEJONG on AUGUST 5! You can still follow him on Facebook and get updates on activities effecting Ottawa County.